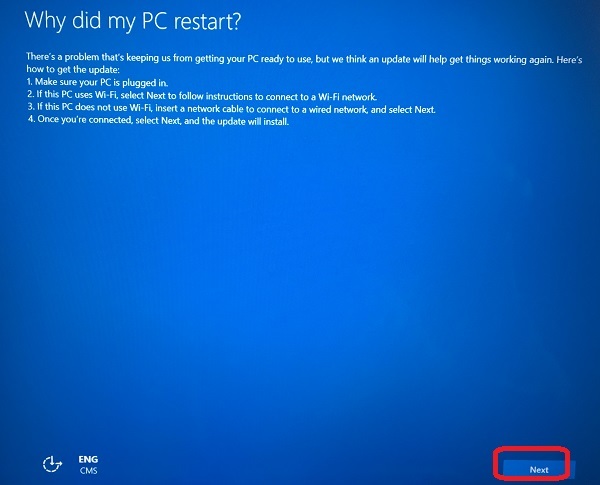 Windows 10 - Windows 10 Setup - "Why did my PC restart?" Why I am getting the "Why did my PC restart?" message? Why did my PC restart? 1. Make sure your PC is plugged in. wired network, and select Next. 4. Once you're connected, select Next, and the update will install. The message is clear, your computer wants to get system updates from HP or Microsoft Websites, since the system installed on the computer might be outdated. Click "Next" and see the next tutorial.